Author(s): Osama Saber, Faculty of Science, King Faisal University, Al-Hassa 31982, P.O. Box 400, Saudi Arabia. Nermen H. Mohamed, Abdullah Aljaafari. Oil spills, particularly from crude oil, cause not only environmental and ecological problems but also high economic loss because of the importance of crude oil in modern industrial society. In this work, a facile and economic method based on magnetic nanoparticles iron oxides was used for the removal of crude oil from water. Various nanostructures and morphologies of iron oxide were successfully prepared by different techniques. Magnetite spinel structure Fe3O4 was prepared by micro-emulsion method. Infra-red spectrum and thermal analyses indicated that the iron oxide particles of Fe3O4 were surrounded and functionalized by organic species. Scanning and transmission electron microscopes images showed that the magnetite structure of iron oxide possesses spherical shape and is in the nano scale 13 nm. Using solvent thermal technique, nano-sheets of hematite structure α -Fe2O3 were prepared with a particle size of 100 nm. The magnetic properties revealed that the nanoparticles having magnetite structure possess super paramagnetic behavior and exhibit relatively high saturation magnetization. The experimental results of oil spills concluded that the nanoparticles of magnetite structure were effective for oil spill removal where 95wt.% of crude oil was removed from the water surface. The mechanism of oil spill removal may be explained though the fact that the small nano size, low density, hydrophobic character and high surface area of Fe3O4 facilitate the penetration process of nanoparticles inside the oil. Finally, the contents of oil spill were simultaneously aggregated and easily removed by an external magnetic field. Affiliation:Faculty of Science, King Faisal University, Al-Hassa 31982, P.O. Box 400, Saudi Arabia. Abstract:Oil spills, particularly from crude oil, cause not only environmental and ecological problems but also high economic loss because of the importance of crude oil in modern industrial society. 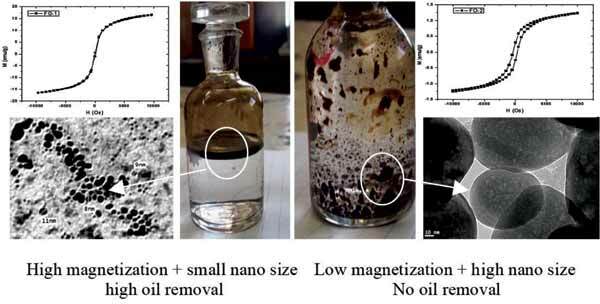 In this work, a facile and economic method based on magnetic nanoparticles iron oxides was used for the removal of crude oil from water. Various nanostructures and morphologies of iron oxide were successfully prepared by different techniques. Magnetite spinel structure Fe3O4 was prepared by micro-emulsion method. Infra-red spectrum and thermal analyses indicated that the iron oxide particles of Fe3O4 were surrounded and functionalized by organic species. Scanning and transmission electron microscopes images showed that the magnetite structure of iron oxide possesses spherical shape and is in the nano scale 13 nm. Using solvent thermal technique, nano-sheets of hematite structure α -Fe2O3 were prepared with a particle size of 100 nm. The magnetic properties revealed that the nanoparticles having magnetite structure possess super paramagnetic behavior and exhibit relatively high saturation magnetization. The experimental results of oil spills concluded that the nanoparticles of magnetite structure were effective for oil spill removal where 95wt.% of crude oil was removed from the water surface. The mechanism of oil spill removal may be explained though the fact that the small nano size, low density, hydrophobic character and high surface area of Fe3O4 facilitate the penetration process of nanoparticles inside the oil. Finally, the contents of oil spill were simultaneously aggregated and easily removed by an external magnetic field.